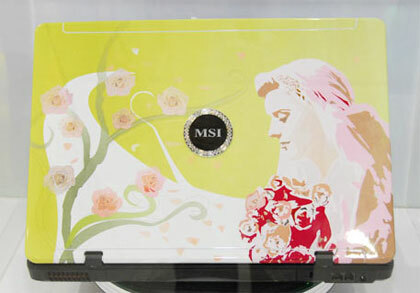 MSI presented its 17-inch gaming notebook ‘GX700’ with feminine images on the top. The general perception of anything high tech and feminine is either Tombraider or Hello Kitty, so it’s good to see that someone is taking the effort to do something different. 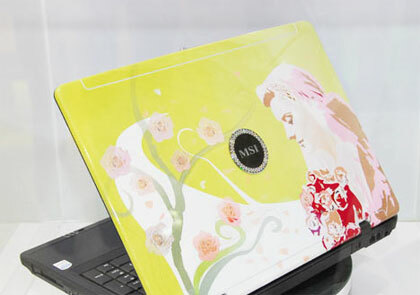 The new 17″ gaming laptop MSI GX700 from MSI feature a feminine beauty on the top. Her elegant features mesmerize you and her specs…err the laptop’s specs are impressive. It boasts of a 1.3M embedded webcam, Intel Centrino Duo mobile technology, nVidia Geforce 8600M GT 512MB, Full DiretX 10 support, HDMI output, 4.1 Channel Speakers and optional Embedded TV Tuner. Seen at the Computex 2007 Taipei, there is no word on pricing and availability of the GX700 from MSI.